The day I moved to New York City is way more poetic in my memory than it actually was. My mother would tell you the air was dry that morning and we didn’t talk the whole car ride to the train station. I tend to exaggerate the whole thing and say I witnessed the birds chirping and the mailboxes waving good-bye with their little red flags as we rolled through New Haven, Connecticut, to get to the station. She would tell you I left stray bobby pins in the corners of my bedroom. I would say I packed everything I needed that day—dreams tucked beside cardigans and wishes packed up against rain boots. That’s always been my downfall, the thing my mother always calls me out on. I romanticize things. I insert heartbreak where there shouldn’t be any. I feel things too deeply. I hold on much longer than I should. All of life has always been one big book of poems to me. I think every person is a living poem—from their hopeful heart to their ugly habits. Life is just too busy to ever stop and dwell on one thing for too long. In actuality, the back wheel to one of my suitcases broke and everything was off balance after that. The wheelless luggage taunted me from the backseat as my mother and I took exit 1 off the highway and approached the New Haven train station. I refused to tell my mother about the broken wheel. She’s never been the anxious type, but she would have worried. And she would have tried—with every last motherly shred in her—to help her baby out. That was me—the baby of the family. There was my older half brother, my real brother who I used to claim was my Irish twin (he isn’t), and then me. I always tell people I am a balance between my mother’s whimsy and my father’s dirt-beneath-the-fingernails work ethic. I’m drawn to deep conversations with people and good-looking Spanish men because of my mother. I’m sucked into collecting things because of my father. The two of them make a good team. My father has been bringing things into our house for years, hoarder-style, and my mother has been waiting for him to fall asleep on the couch to cart all of it off to Goodwill. I’m somewhere in the middle—always wanting to hold on to everything that comes into my orbit and let it go all at the same time. For the longest time growing up, a lot of people didn’t even know I existed. People were surprised to learn the gangly, redheaded child who was silently weaving friendship bracelets beside the fences at baseball games was the sister of these boys who were town legends when it came to diamonds, or courts, or any kind of arena that was competitive. I lived in their shadows a lot. It wasn’t anything I did on purpose. I just kept to myself. And I liked constructing my own little worlds where I could control all the elements and pretend I was best friends with all the good-looking men and women in the JC Penney catalog, models I cut out and pasted into my little-kid diaries. I was the last one of the family to leave the house with the turquoise shutters and morph my parents into empty-nesters. My oldest brother had gone off to college and then moved in with his girlfriend. He and I were different in the sense that he’s always known just what he wanted and gone after it. And me? I’m more of the type to have an existential crisis over selecting a coffee flavor for the morning. My other brother struggled with addiction at the time, so he lived in the house when he was sober and out of the house when he was not. As we waited for the train, I watched my mother wedge something into the belly of my suitcase, with the hope I wasn’t looking. I tried to force myself to forget it was there. I fidgeted and folded my ticket, waiting to leave. I knew it was a letter. It was always a letter. My mother is a nostalgic creature. There are three things you should know about my mother: The first is that she is always, somehow, the life of every party. The second is that any person my mother has ever loved could tell you the exact way a kazoo sounds when it’s left in a voice mail on your birthday. It’s nailed tight to my memories of growing up—watching her flip through the pages of her address book and find the name of whoever it was she’d marked on her calendar. I remember hearing the dialing of the cordless phone. My mother would wait. And then the sound of a kazoo being played to the tune of “Happy Birthday” would stream throughout the house. The third thing to know about my mother is that she’s a nostalgic creature and I have to believe she made me into one too. She’s hidden love letters for me to find all my life. There was a note tucked on top of a piece of chocolate cake when heartbreak visited my freshman dorm room for the first time. There was a card left on my dashboard the day after Whitney Houston died. Confetti fell out from the inside. Musical notes skittered across the front. She wrote six words to me in red Sharpie: And I will always love you. I am the product of my mother’s bread crumb trails of love letters. Every coming and going we’ve ever shared has been built up with letters, notes, trinkets, and the like, as if tiny wedges of paper and confetti could keep a person always coming back. She’d trailed tiny clues four years earlier as we moved me into my first dorm room. I found letters tucked in plastic Tupperware bins and notes within books I hadn’t even opened yet. Pieces of my mother would pop up and appear throughout the semester. In random classes. At staff meetings. On retreats. My mother is an expert at leaving evidence she was here in the lives of everyone around her. The breath fell out of me when I read that quote for the first time. I kept reading it out loud. I felt bare and exposed through my mother’s scratchy handwriting whenever I read it. The card with the quote inside of it somehow got lost and my mother couldn’t remember what issue of O she found it within. I spent the next summer going through every O magazine at the town library, looking for any last evidence the paragraph ever existed, but I never found it. I’m still looking. I guess I never understood the power in her letters, or the reason why she sent them, until my grandmother died. I was a college freshman when she passed. It was September. The air was changing. My grandmother had spent that whole summer sitting in a hospital bed, delirious. She was like a stranger who borrowed the eyes of someone I loved. I knew my mother and all her siblings were just waiting for the release, a way to tell one another she was finally gone and in a better place. The call came three weeks into the semester. In the span of a weekend, I heard my father deliver the news, packed a duffel bag full of all the black clothing I owned, traveled home, tried to apply mascara to swollen eyes, laughed until I couldn’t help but cry, swapped stupid memories with cousins, watched my grandmother get closed in a casket, and learned that missing someone is just the beginning of grief. Then I traveled back to college to push forward into my fall semester. It happened quickly, like ripping off the Band-Aid, trying to pretend there was no sting. Death is like that—it can teach you more in forty-eight hours than you’ve learned in a lifetime. It’s beautiful outside. We took Scarlett and Chloe for a hike the other day. I’ve started crying. Finally. I find myself going into the bathroom, shutting the door, and spitting on the bathroom floor. Something feels freeing about that. I pictured my mother hocking wads of saliva onto the tile floor. Spitting and crying. Spitting and crying. Trying, through the spitting, to let her sadness release. Letting loose on the linoleum. The image in my mind looked pitiful. Desperate. Too hard to watch for a girl who’d only ever allowed her mother to be strong in her eyes. It was one of the first times I realized you can tell a completely different story to someone when you’ve got all the vulnerable space of a page to back you up. You can say things you might not have the courage to say elsewhere. You can let honesty loose on the page and then fold it up and drop it in the mailbox. Away, away the release of your troubles could fly. That letter is still the most treasured chunk of my mother I hold. Like a secret only I know. I kept the card on my wall all four years of college. I packed it with me on the day I moved to New York City. “Do you need any help?” she asked as I bustled the suitcase with the broken wheel onto the platform. She got real quiet. I wasn’t being nice. I get snappy when I know a good-bye is coming. I sort of shut down and close off. The last thing I wanted my mother to know was that all of this was hard for me. Realistically, I would only be a couple hours away from her. But somehow we both knew something different was happening this time. It wasn’t like the kind of good-bye you said before college or summer camp. It sat in the throat for a very long time and made you hope you’d learned enough from the other person to be okay on your own. “You have everything you need?” she asked. I nodded. “I made this for you. For the train. If you get hungry.” She pulled out a thick wedge of tinfoil from her red pocketbook and placed it into the side pocket of my carry-on bag. Without unfolding the square mess of silver, I knew it was two peanut butter and jelly sandwiches. Four slices of whole wheat bread. Peanut butter from Trader Joe’s. Raspberry jelly. She’d handed me those wads of tinfoil for the last fifteen years. They were the first form of religion I ever knew, before a Bible or a pew. Just several sandwiches she carried with her always to pass out to hungry people she would see along the way in New York City. She never took a train into the city without them. She taught me to be a brave little child who walked up to bums and handed them peanut butter and banana sandwiches. No matter how many sandwiches she packed to hand out, there was always one left for me. It was her way to tell me, “You’ve got this. You’ve got this day, but you’ll grow hungry along the way.” All those years, we called it Sticky Love. And that’s just what my mother always told me to aim for—Sticky Love. It’s different than a skinny kind of love. It is a love so much rarer than the kind your eighth-grade boyfriend could give you. It’s big. It’s loud. It makes you into the kind of person who leaves something behind when they finally turn to walk away. And though no one can quite touch it or understand the DNA of it, everyone can still tell, by the way the atmosphere has shifted in the room, something was left behind. As the train pulled into the station, she reached in for a hug. “I love you. Be good. Be safe,” she whispered. It felt like we’d been on that train platform for hours. “I love you too,” I whispered back. We pulled away and I walked toward the train. I hoped the engine would start and pull away quickly. I needed her to go home. Like I said, good-byes have never really been my thing. I’d rather go in the night. Leave a note. Walk away quickly and not linger in a hug. I don’t want to be the one left standing there. It’s the hardest part about making new friends and giving them rent space in your heart; you have to be okay when they tell you it’s time to go away. I tried to focus on the passengers around me. They were staring down at their newspapers. There were businessmen wearing suits that looked stifling in the August heat. I noticed a woman two rows up standing outside the train. She was putting her hands up against the window and leaning her forehead against the tinted glass. It was my mother. Trying to find me. One last time. She looked crazy enough to scare the people sitting in the seats ahead of me, with her head of gray hair and plain desperation painted across her face. She didn’t look like poetry in that moment. She looked like someone who didn’t know how to say good-bye. She went window after window until she came up next to mine. I sat back as far as I could in the seat and sank down low so she wouldn’t see me. If she found me, she would see the tears dribbling down my cheeks. She would know I was afraid of everything ahead of me. Of never finding significance. Of missing the point. It was like I packed each emotion up the second I felt it, not wanting to look it in the face. That sort of stuff becomes baggage if you don’t take the time to unpack it. She peered for a few moments and then walked back to the middle of the platform, her red satchel at her side and matching red flip-flops on her feet. I put my hand up against the window and scripted a letter to her silently in my mind. Life is looking brighter than it ever has before. Even with you looking a bit pathetic with your face smashed up against the train window, we both know that life is looking bright for me. This is my chance to make you prouder than you’ve ever been before. I know you’d tell me you’re proud already, that no motive in life should ever be about making someone proud, but I can’t help but want it. I know you’re worried about me. Not because you think I am incapable but because you secretly have always worried that life would go by without my ever learning how to stomp in the puddles or fall in love. I can promise you I’ll learn. If anyone is a teacher for that kind of stuff, it has got to be New York. Thank you for letting go. Even if we both could have held on longer, thank you for letting me go. I never did say those things to her. So many of the things you think and want to say to a person never spill out in real life. They stay locked in secret rooms inside of you. They live for tiny lifetimes inside the hearts of people who don’t have the courage to say what they meant this whole time. Some people leave, and go, and die, and change, without your ever getting to tell them how you truly feel about them. 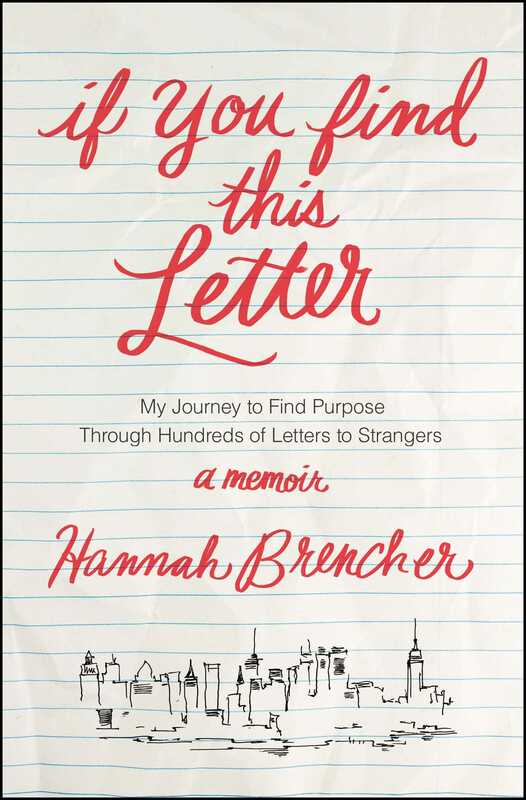 Hannah Brencher is a writer, national speaker, and founder of The World Needs More Love Letters. The global community has grown to over 20,000 individuals across six continents, fifty-three countries, all fifty states, and is established on over sixty-three college campuses. Named as one of the White House’s “Women Working to Do Good” and a spokesperson for the United States Postal Service, Hannah has been featured in The Wall Street Journal, Oprah, Glamour, USATODAY.com, Chicago Tribune, and dozens of other publications. 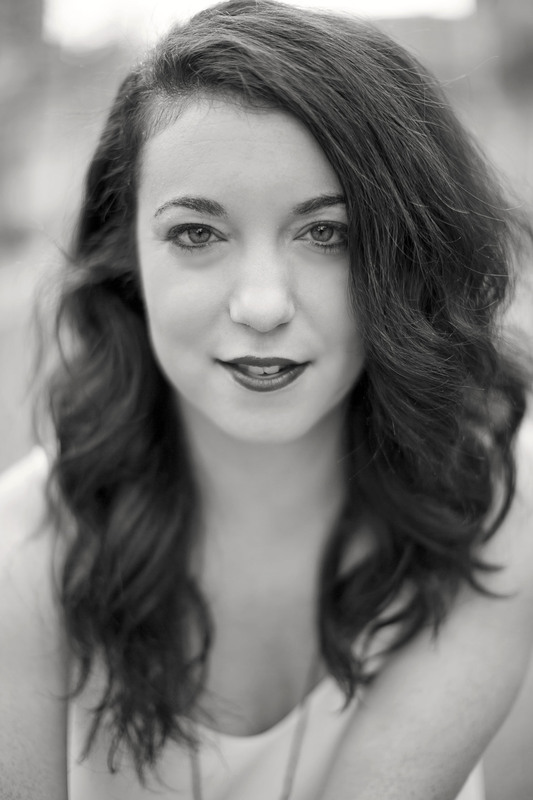 Hannah graduated from Assumption College in 2010 with a double major in Sociology and English, with a concentration in Writing and Mass Communications. For more information, visit HannahBrencher.com or MoreLoveLetters.com.